The RIDER Institute Announces Crowdfunding Campaign to Raise Funds for Broad Spectrum Antiviral, DRACO. An IndieGoGo campaign beginning May 3rd will raise funds to test and optimize DRACOs against major clinical viruses. Invented at MIT, DRACO may be effective against virtually all viruses. The RIDER Institute announces an IndieGoGo crowdfunding campaign to help fund Dr. Todd Rider's research and development of DRACO broad-spectrum antiviral therapeutics. DRACOs have proven effective against all 18 viruses tested in previous proof-of-concept experiments. In the campaign that starts on May 3, 2016 at http://igg.me/at/EndTheVirus and runs for 60 days, we are raising new funding to test and optimize DRACOs against major clinical viruses in cells. If this work is successful, it should lead to preclinical animal trials and ultimately hopefully to human clinical trials. 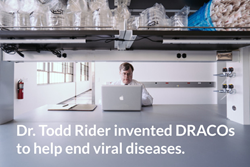 Dr. Todd Rider invented DRACO (Double-stranded RNA Activated Caspase Oligomerizer) broad-spectrum antiviral therapeutics at MIT and published proof-of-concept experiments in the peer-reviewed journal PLoS ONE (http://journals.plos.org/plosone/article?id=10.1371/journal.pone.0022572). In human and animal cells, DRACOs have been effective against 18 different types of viral infections, including two different strains of H1N1 influenza (flu), four strains of rhinovirus (the common cold), two adenoviruses, dengue hemorrhagic fever, and others. In initial mouse trials, DRACOs have been effective against influenza and three hemorrhagic fever viruses. Just as the development of antibiotics revolutionized the treatment and prevention of bacterial infections in the mid-20th century, DRACOs have the potential to revolutionize the treatment and prevention of a wide range of viral infections. Dr. Rider’s DRACO approach and results have been called “visionary” by the White House (National Bioeconomy Blueprint, April 2012, p. 9), named one of the best inventions of the year by Time magazine (November 28, 2011, pp. 58, 78), and featured on the BBC Horizons TV program (2013). However, DRACO research has entered the well-known “Valley of Death” (http://opinionator.blogs.nytimes.com/2011/05/02/helping-new-drugs-out-of-academias-valley-of-death/), in which many promising new drugs have difficulty obtaining funding to bridge the gap between initial proof-of-concept experiments and later large-scale development and trials. Therefore, we are launching this IndieGoGo campaign to raise enough funding to produce, test, and optimize DRACOs against herpesviruses in cells. The herpesvirus family contains many major clinical viruses such as herpes simplex, varicella zoster (chickenpox and shingles virus), and other important pathogens. If these crowdfunded experiments are successful, they should persuade sponsors to commit further funding to advance DRACOs through preclinical animal trials and ultimately hopefully to human clinical trials. Visit riderinstitute.org and our crowdfunding campaign for more information.